Do Charlotte City Council’s New E-Scooter Rules Make Us Any Safer? Since Charlotte became one of the many cities to be inundated with rental e-scooters in 2017, there has been much discussion about how to regulate e-scooter usage in the Queen City. As we wrote in a previous article last year on e-scooters, there are many uncertainties when it comes to the risks that riders take when they agree to rent an e-scooter through an app on their phone. Some of these concerns include worries related to safety, financial responsibility for accidents or injuries involving rental bikes/scooters and when, where and how the vehicles can be ridden. The Charlotte City Council has debated the issue and put a lot of time and thought into the rules that are in place for these popular e-scooters. The Charlotte Observer reports that in December alone, Charlotte riders racked up 82,523 trips covering 81,484 miles. With those kinds of numbers there are certainly going to be discussions regarding safety, financial responsibility and how the scooters should be regulated to best impact residents and the city. While the scooters have been very popular and have made an impact for people making small commutes around uptown, there have also been concerns specifically related to crowded sidewalks caused by riders and the scooters themselves when they are abandoned after a ride is over. Scooter speeds are to be capped at 15 mph. Scooters are now banned in the densest part of uptown Charlotte – the area is bounded by Stonewall, Seventh, College and Church Streets. Outside of that area, sidewalk riding will be permitted. The number of overall scooters allowed in the city can be increased when scooter companies can document that their scooters are being ridden an average of at least three times a day for 30 days. The number of scooters a company can have in the city can also be reduced if the average number of rides should fall below 2 rides per day. The city of Charlotte can now charge the scooter companies a fee for allowing the scooters in the city. Before now, there has been no fee assessed to these companies for the costs incurred by scooter companies use of the city’s public infrastructure (roads and sidewalks). Scooter companies are no longer required to have 20 percent of their vehicles in low-income neighborhoods. The city will still encourage the companies to put more scooters near transit and bus stops. While these rules will certainly impact the way that e-scooters are being used in our city, the Charlotte City Council stopped short of making any requirements related to helmet or insurance requirements. At this time someone renting an e-scooter is not required to wear a helmet when they ride it. Additionally, there are also concerns about financial responsibility for accidents and injuries caused by negligent use of these e-scooters. If someone using one of these scooters in a negligent or unsafe manner causes an injury to another person, there is no liability insurance to recover against in the same manner that there would be if the accident was caused by an automobile. If a pedestrian or someone in a car is injured by an accident caused by one of these scooters, how will these injured people recover money for their medical bills, lost wages or other compensable damages? At the state level, the NC Legislature may choose to make state-wide requirements that could potentially supersede the regulations that are in place throughout Charlotte, and other cities in NC such as Raleigh and Greensboro. Requiring helmets and liability insurance would be a step in the right direction as far as additional regulations that need to be implemented. The timing of these regulations should also be in a timely manner before too many people are seriously injured with injuries and damages that could be limited under the proper types of government oversight. As the use and regulation of e-scooters continues to evolve, the effects of the current rules will have to be consistently looked at if we truly expect them to have a significant impact. 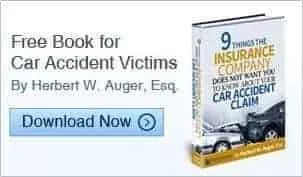 Auger & Auger Law Firm is an injury law firm that handles cases related to car, truck, motorcycle and tractor trailer accidents, as well as other types of injury cases. Our firm focuses on helping people that have been injured because of the negligence of others. If you or someone that you know has been injured in a scooter, car, truck or any other type of accident involving a vehicle, give us a call. We will provide a free case evaluation to see how we can help. Our phones are answered 24 hours per day, every day of the year. Please call our office at (855) 971-1114.